Spring has been absolutely beautiful here and I am finally enjoying being outside working in the yard. No wind. No freaky snowstorm. Just wonderful sunshine! As I spend more time outdoors I like to think about bringing the indoors~out. These are some beautiful outdoor spaces to inspire. This outdoor room has it all! Would I ever get anything done once I sat down here with a cup of coffee?! 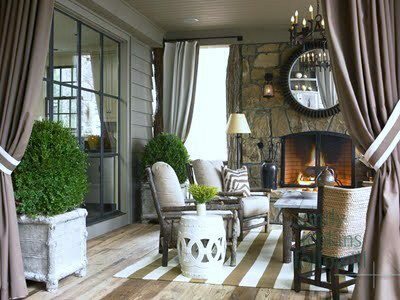 Not only does it have outdoor seating, but I love the drapes, stunning fireplace and of course boxwood topiaries! Steel windows add an industrial touch, and lighting is a must. 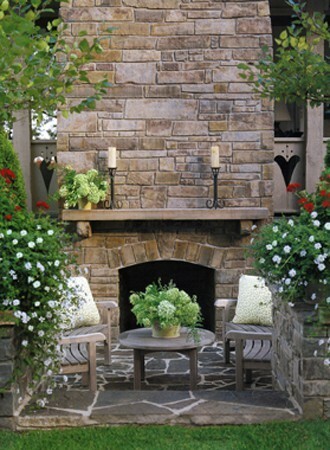 This gorgeous outdoor fireplace is truly the focal point of this outdoor seating area. 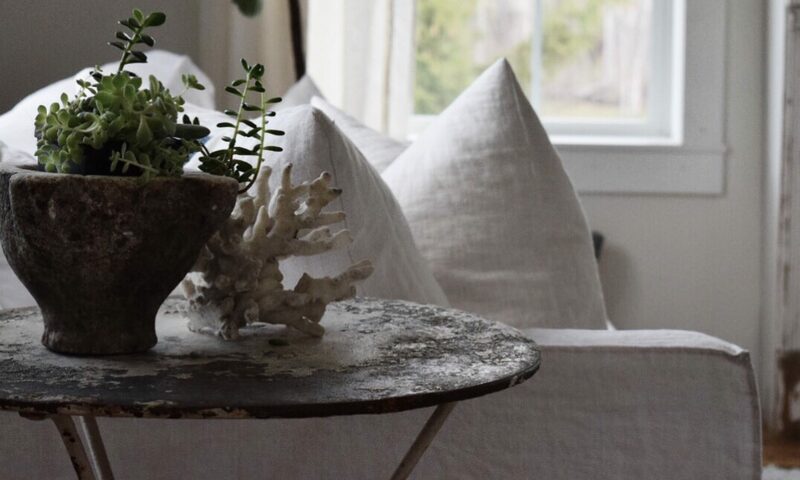 Love the grey tones in the rock and furniture. 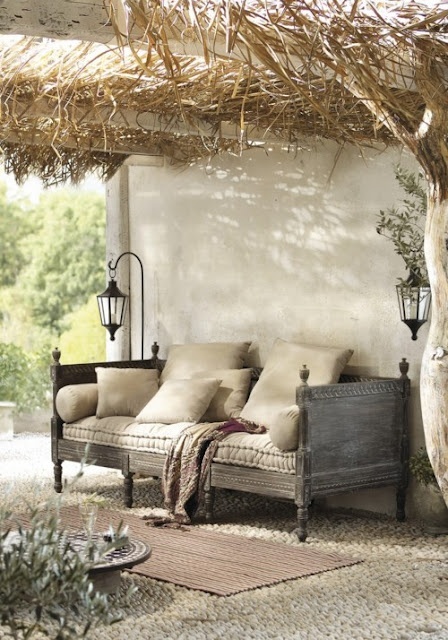 Neutral color scheme with a French style daybed would be great outdoors or in! 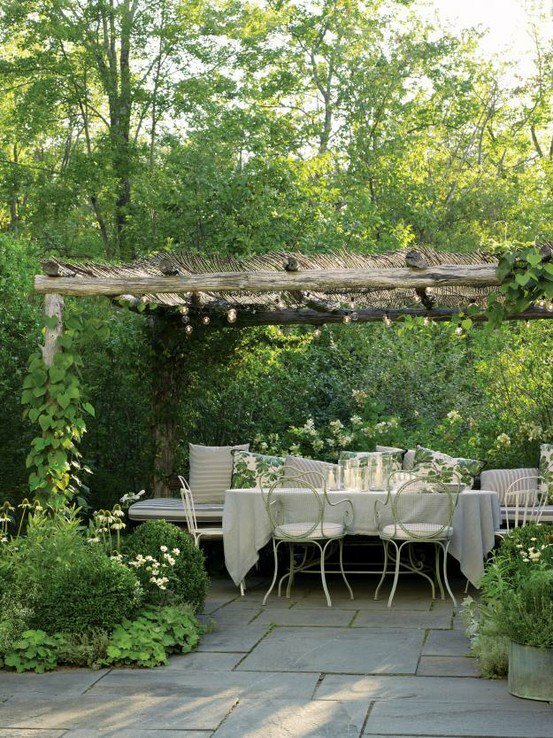 A rustic arbor adds charm to this simple outdoor dining space. 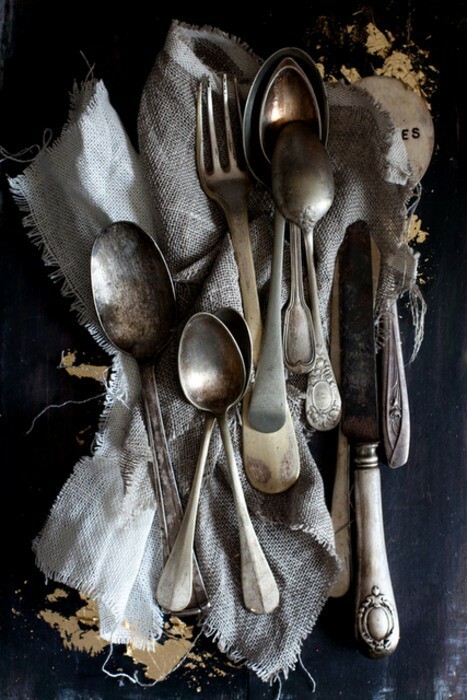 This is vintage French Grey at it’s best! 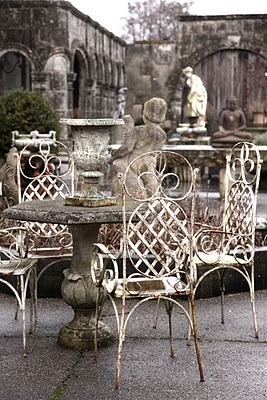 Adding a vintage piece, whether it’s a statue, birdbath or a piece of furniture brings an architectural element to the garden. 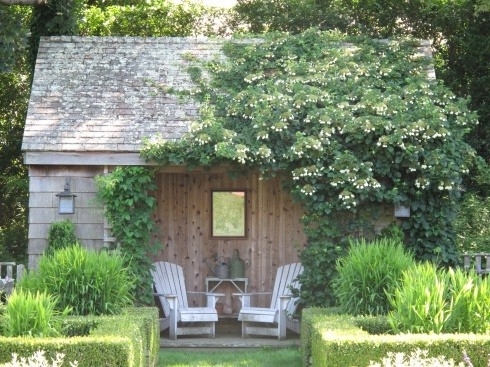 This is a perfect way to furnish a transitional space between house and garden. Love the stone floors, linen ottomans, industrial table and lovely lantern! Can you ever have too many urns?! Love the wooden beams, stonework, arched windows to bring in the garden view and grouped seating areas for easy entertaining. 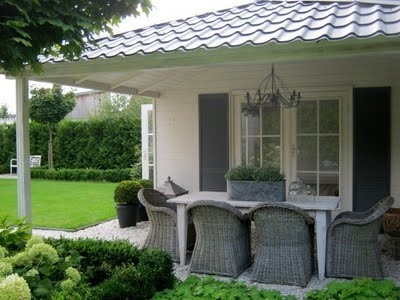 Even if you only have a simple shed you can create a cozy outdoor room. A couple of chairs, lanterns and a mirror to reflect light and the gorgeous scenery and you have a place of repose. Of course, I probably couldn’t sit here for long without seeing something that needed to be deadheaded or a weed to pull! Hope ya’ll have a great weekend while you think about creating, daydreaming or enjoying your special space outdoors! Shall I have coffee, lemonade or a glass of wine…. 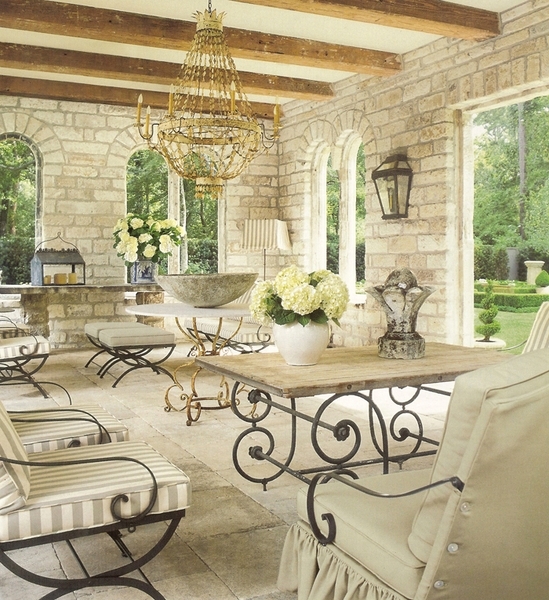 Oh Cindy, all these outdoor rooms are fabulous! I really love the roomseventeenstyle one though – that set is exactly what I have in mind for my patio. Divine inspiration here! Sharon, I really love that one too! Grey wicker and whites, very simple with loads of style! I came home with a few boxwood’s today too! 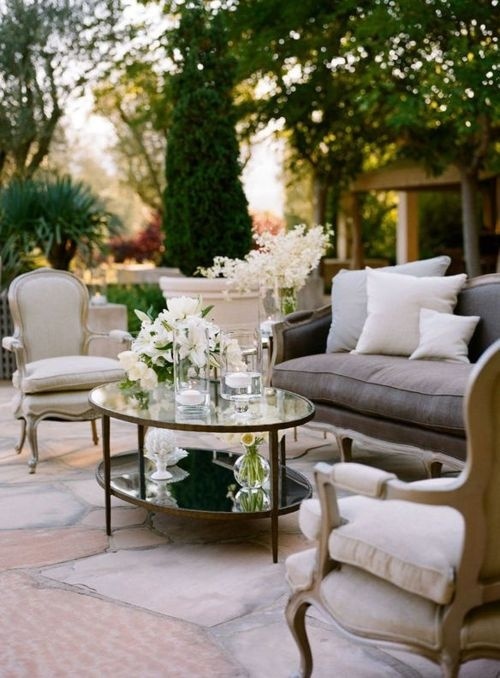 OMG this post is beyond lovely:) I want to be in all of them outdoor spaces. Oh my goodness. This is too beautiful!! !